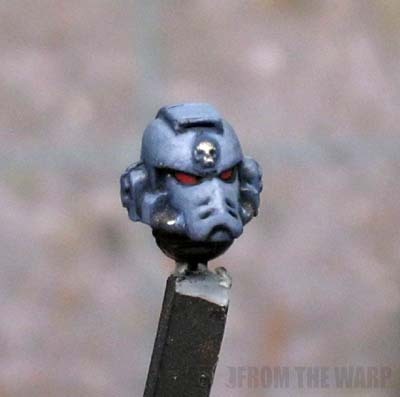 Now that I've built one, there are certainly some changes I would make, but I don't think I'll need to buy any more MK4 helmets now that I know I can make my own using a normal Space Marine helmet and some greenstuff. The conversion is quite simple really and I'm certain I'm not the first one to share the idea. 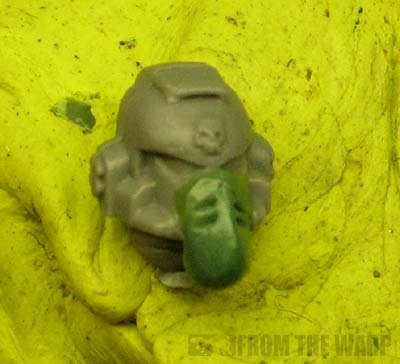 Hopefully my experiment and explanation will help some of you all overcome the hurdle of finding enough of this particular style helmet to outfit a Space Marine squad without going broke in the process. As far as converting goes, it's a fairly simple and straightforward process. The only thing is making sure you do things in a certain order to make it as easy as possible. We start with a regular helmet as our base. You can see what the MK4 style looks like next to it. We're going to add that stylized, sloped nose to the front of our regular helmet. 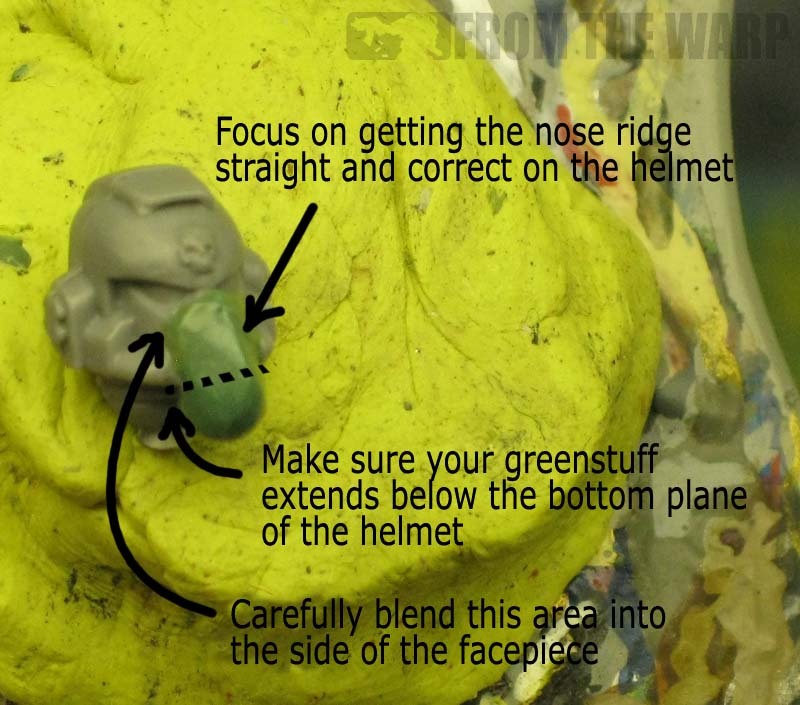 We start by adding a small blob of greenstuff to the front of our helmet. It doesn't take much. Don't worry if you added too much, we can (and will) cut off the excess at a later step. What portion you focus on first is important. 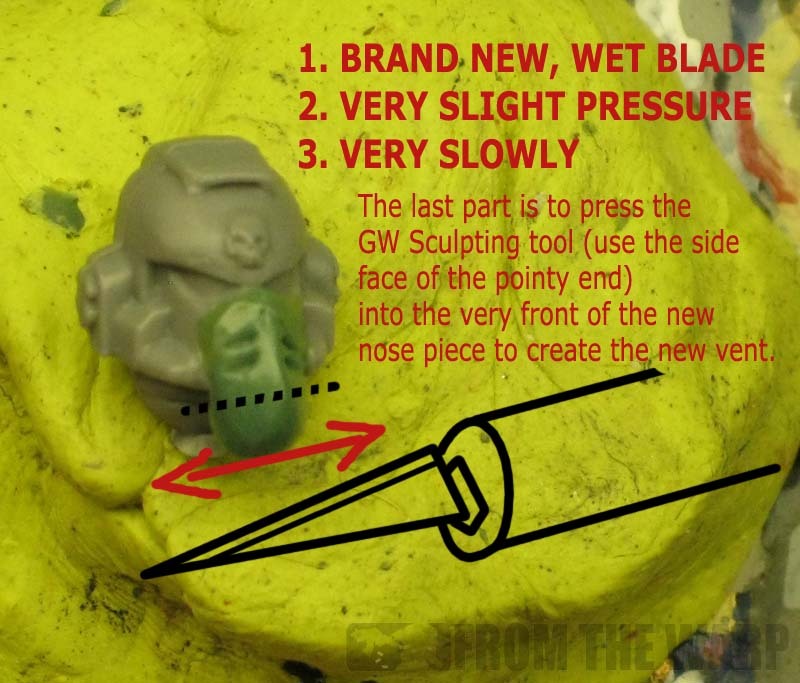 Once you have your greenstuff in place, focus on the cheeks first. Make sure your greenstuff blends into the sides of the facepiece first before worrying about the shape of anything else. Get those sorted out now so you're not trying to "fix" them later on and run the risk of messing up your work. Once you have the sides blended, focus on the ridge of the nose. Get that straight and crisp down the center. Don't worry about any excess greenstuff as you work, just push it downward... we're going to remove it shortly. The nose ridge is created by pressing in on either side at an angle and going back and forth between the two until you can shape the ridge and get it situated correctly. Once you have the sides blended and the nose ridge sculpted in place, you can add the vents. I used the pointy end of the standard GW sculpting tool to press mine in place. In hindsight, I should have made them a bit more pronounced and maybe thought about adding three instead of two, but this will work just as well. I know this part may give some folks some trouble, but it's the key to getting this done in one pass. If you don't want to try this, skip it, wait for the greenstuff to cure and then cut away the excess. It just means the hlemt will take slightly longer to sculpt. Not a big deal at all. Taking a brand new X-Acto blade that is very wet, carefully cut (using a sawing motion) away the excess greenstuff from the bottom of the facepiece. Taking your time, you should be able to do it without disturbing your sculpting work above. Once you have the bottom cut off flush with the bottom of the regular helmet, you can use your sculpting tool and make a small indentation for the mouth vent if you want. Here's the completed helmet compared to a real one. Not too bad and it should certainly pass normal inspection. If it were 10 of these on a squad or spend a ton of cash for real ones, I'm going this route every time. And just for good measure, here's the helmet painted up. You can't really tell it's conversion and that's perfect for me. I think I may try the process again and let the greenstuff cure before cutting away the bottom excess material. I want to see if I can get a nice, crisp edge along the bottom there. That and I want to see if I can squeeze three vents in along the nose ridge instead of just two. Great conversion work and tutorial! It was very easy to follow and should be straight forward to implement. i've done the same on mine but have based it on the FW design where the face plate seems flatter. A bit of shaving is involved on the grill plate. My only issue is getting it to blend in and so the vents look big enough. Looking good Ron, thanks for sharing! 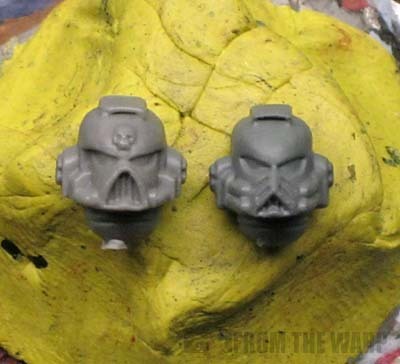 Looks good, but a few vertical lines pressed with an xacto or painted into the mouth would probably bring it just a smidge close to the fw version. Anon: He does... I think I can fix that with some careful sculpting or maybe waiting for the greenstuff to dry before I cut the bottom excess material off. jabberjabber: It is super simple. Xepher: There is some fine tuning to be done. Getting the vents to be prominent enough is important. I want to try adding three vents instead of two. I had no trouble getting it to blend in though myself. Mike Howell: I think I'm going to try again to see what changes I have to make to get it more in line with the FW version. I just don't want it to be a huge undertaking otherwise it may become easier to just buy the bits and save the headache. Looking over the post again, your sculpt is more in line with the illustration. Between the two I prefer the illustration's look. 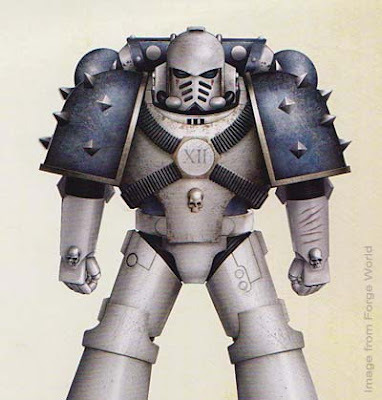 Given the choice of the two I'd leave the mouth grill off unless you really have a thing for the FW model. I think I'm going to try making one without the mouth vent and instead make it look like an armour plate there with three vents instead of two. And wings instead of a backpack..... definately... yes mwahahahaaa! Very nice. I think you could improve it further by sanding the helmet slightly by the eyes to remove the "step" there. Lasgunpacker: Absolutely. You could fine tune this for some really nice results. I think it works as is for a down and dirty solution and I have faith it would work for a squad instead of coughing up the money for bits. While I like this Ron, I think I'd do all the sub operations except the cutting of the GS, and save that til it was hardened, because it's less likely to pull and warp the rest of it that way. Faolan (Jake): Either way, the trick is using the approach that you're more comfortable with. I think I'm going to try it that way too. I really wasn't convinced with the end result until I scrolled down and saw the painted version and I've got to be honest, it looks really good. james: Thanks! Considering the cost of buying the individual helmets as bits, this one is definitely close enough for me.